With over 30 years of expertise in the development of large architectural enclosures, United Skys has provided clients with the possibilities of creating skylights utilizing custom extrusions and design. Anything from large geometric shapes to simple ridges and everything in between. Our service solutions consist of preliminary design consulting, budgets, project management, testing, manufacturing, and installations worldwide. At United Skys, we’re not just designing skylights, we’re designing a brighter world! United Skys has provided clients with the possibilities of creating skylights utilizing custom extrusions and designs, large intricate geometric shapes and complex engineering and manufacturing. From curved to segmented, simple to multi-spans, or overhangs on all sides, United Skys provides a solution for all designs. Standing seam polycarbonate systems are very similar in concept to a standing seam metal roof. Each panel has upstands which are held together by a batten, which clamps the two adjacent panels together. This creates an entirely polycarbonate system with no aluminum break. There are a variety of colors available and different thicknesses that have different spanning capabilities. This system is typically used in canopies, vertical walls, or screen type applications. Tongue & Groove polycarbonate systems are a modular panel, each panel fits together by an interlocking end. This interlocking system eliminates any need for an aluminum break along the length of the system. Typically used in vertical wall applications, this system uses a 40mm thick panel coextruded with 7 walls giving it a very low U-Value. Flat sheet polycarbonate is used in our tubular mullion system. This system replaces the glass with a translucent glazing option. One main advantage is working with a lighter material without losing the thermal properties in comparison to a standard insulating glass unit. This polycarbonate glazing option is often used in skylight applications. United Skys noticed a need in our industry to shorten leads time from project initiation to installation as well as provide a cost savings for customers who sought a custom skylight for more intimate spaces. When we began this adventure – our task was simple – bring our quality custom skylights to a broader market by decreasing both lead time and costs. 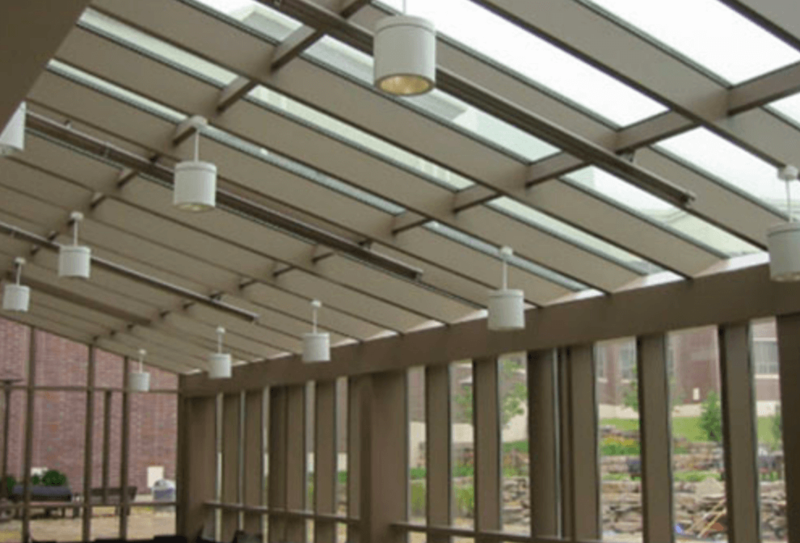 We created our Pre-Engineered Skylights, FasTrak, to provide those benefits and more. Since the products are based on predesigned criteria that can be automated, it allows us to reduce the lead time dramatically along with the cost, all while maintaining the quality we are sought after and known for. This means that we can provide our customers a quality custom skylight at unit sky light pricing. Our pre-engineered products span a large variety of options to allow for customization. We can provide a skylight any size up to a 15 foot width with multiple glass and finish options – including thermochromic glass!